Volkswagen has released new special edition variants of the Up, Scirocco and CC, adding additional extra equipment for a small price premium. Order books for all three models are open now. The Up is now available in ‘Look Up’ trim, with a choice of three colours – red, yellow or white. Based on the Move Up, it gains unique 15-inch Fortaleza alloy wheels, unique interior trim and black exterior styling details, adding almost £1000 of extra equipment but for a premium of £70, versus the Move Up. The CC is now available in with Black Edition extras, based on GT and R-Line trim levels. Both get a styling pack with black front grille, electric sunroof and 18-inch alloy wheels. Inside there is Carbon Nappa leather upholstery and piano black inserts. Pricing starts at £29,150 - £575 more than GT or R-Line. 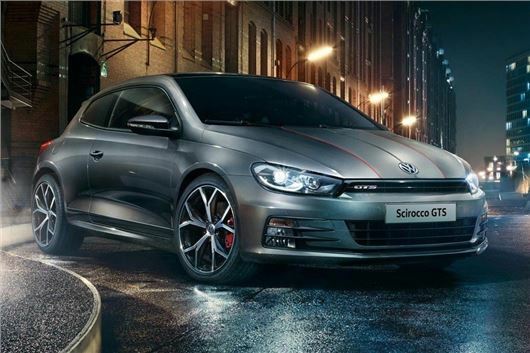 Volkswagen has also introduced a new GTS version of the Scirocco. This gets a 220PS TSI petrol engine not available in other Scirocco variants, which gives a 0-62mph sprint time of 6.5 seconds and a top speed of 153mph in manual variants or 152mph with a DSG auto. Peak torque of 350Nm is available from 1500rpm. Externally the GTS has the same styling kit as the R-Line, but with GTS badges and some gloss black details. Urano Grey is the standard colour, but there are five optional colours too, all of which get specific co-ordinated bonnet, roof and tailgate stripes. The colours are Flash Red, Pure White, Oryx White, Indium Grey and Deep Black. Inside, the Scirocco GTS features Vienna leather upholstery with GTS logos, a GTS-specific golf ball gearknob, seat belts with red stripes, and piano black trim details. The Scirocco GTS is priced from £28,195 with a six-speed manual or £29,695 with six-speed DSG automatic.